Adam Ivy built the house that still stands today replacing a log cabin that had once been on the property. Family tradition claims Ivy's second wife helped finance the house with money from the sale of gold dust (1, p. 2). 1888  Ivy moved to Florida and sold the plantation to his step-daughter's son, Dr. James D. Nisbet (1, p. 2). Dr. Nisbet practiced medicine in New York City for 40 years. His mother and brother resided at Adam Ivy during this time (1, p. 2). 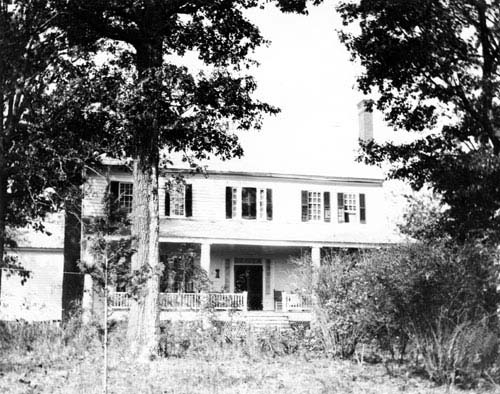 1933  Dr. Nisbet enjoyed his retirement dairy farming at his plantation home. Upon his death in this year, the house passed to his widow Beulah (1, p. 2). 1960  Beulah died this year and the house was empty for eight years until it was rented (2). 1978  Terry and Genie Graham purchased the property. Genie is a descendant of Dr. Nisbet (2). Two-story Greek Revival house. There were additions and renovations to the structure in the 1920s (1). The barns on the property were constructed in the 1920s by Dr. Nisbet (1).